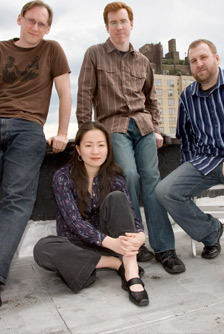 In its third concert of the 2012-13 season, Ear Heart Music presents two vigorously talented quartets of uncommon instrumentation to juxtapose factors of stasis and motion in music. Flexible Music, “a feast of intimate musical possibilities,” (Gramophone) performs a set of musical sound sculpting using static structures and gestural language, with music by Peter Adriaansz (US premiere) and Seung-Ah Oh. The Cadillac Moon Ensemble, a “commission-crazed young group” (Time Out NY) “with excellent ensemble awareness and phrasing” (The Examiner), follows suit with a program exploring motion in all its forms, including world premieres by Caleb Burhans, Osnat Netzer, and Alex Weiser with additional works by Timothy Andres and Florent Ghys. Flexible Music’s program features work by two fascinating protégés of Louis Andriessen, the influential Dutch minimalist. Peter Adriaanz’s (current composition faculty, Royal Conservatory of the Hague) companion works Fraction and Phrase, commissioned by Flexible Music, explore the fascinating and hypnotic world of microtonal beatings within a dense rhythmic context. Employing minute, incremental changes in tuning and pulse on all the instruments, Adriaanz creates a landscape in which the fundamental fabric of pitch and rhythm that we so often take for granted becomes variable and thereby the dynamic focus of the piece. Seung-Ah Oh’s (current composition faculty, De Paul University) Fragments blends pentatonic material played inside of the piano and on guitar harmonics with pleading microtonal saxophone and slide guitar lines. Liberal use of guitar loops, Chinese bowls, and built instruments craft a sound world that is both deliberate and unique. Rounding out the program is Mikel Kuehn’s (current composition faculty, Bowling Green State University) Color Fields, also written for Flexible Music. Color Fields takes the canonic texture of Andriessen’s Hout, and manipulates it as one might manipulate a rubix cube, reordering the canonic entrances so that instead of a pointillistic approach to writing for the ensemble, we are taken into a cubist sonic landscape, with refractions of instrumental sound that demand constant readjustment. The Cadillac Moon Ensemble follows suit with a program exploring motion in its many different forms: how things move, where they move, and what can move. The concert features three world premieres by Caleb Burhans, Alex Weiser, and Osnat Netzer, as well as two other works that were written for CME in 2012 by Florent Ghys and Thomthy Andres. Ghys’ work is named after a métro station in Paris and is about smooth transitions between two worlds. Also about the subway, Weiser’s piece is a multi-movement work exploring memories of growing up in New York, associated with different subway lines. A game of musical telephone, Andres’ piece germinated as a short melody on an airplane which passes from one player to the next, mutating slightly each time. More abstractly, Osnat Netzer uses the concept of motion to work out her fascination with hip hop, using the instruments rhythmically to propel the piece. Inspired by Louis Andriessen’s piece Hout for saxophone, guitar, piano and percussion, Flexible Music has been performing its dynamic brand of repertoire for this versatile instrumentation since 2003. The group has commissioned over thirty pieces by some of the most respected mid-career composers active today. Recent seasons have included concerts on the Macau International Music Festival in China, at the Kennedy Center’s Millennium Stage, and in the Mid-American Festival of New Music New Focus Recordings released their debut CD FM in March 2009 to critical acclaim. They can be heard on another release from New Focus, Sustenance, as well as on releases on Capstone and Albany records. With its unique combination of flute, violin, cello, and percussion, Cadillac Moon Ensemble is dedicated to retaining the intimacy and artistry of traditional chamber music, while expanding its palette of sonic possibilities. The group formed in 2007 and is focused on commissioning new works and developing integral relationships with emerging composers. Cadillac Moon Ensemble has commissioned and premiered over fifty works to date with recent pieces by Timothy Andres, Caleb Burhans, Angélica Negrón, David Claman, Amy Beth Kirsten, Lukas Ligeti, and Zack Browning. Season highlights from 2011-12 include collaborations with Blind Ear Music and Random Access Music, and the release of CME’s debut album Atlas on New Dynamic Records, recorded during a week-long residency at Indiana University-Southeast. The group can also be heard playing Zack Browning’s music on Innova Records and was recently featured on WNYC’s New Sounds program. Ear Heart Music “has become a staple in the New York new music soundscape.” (Time Out NY) Its thoughtfully designed programs highlighting recent masterworks stimulate creative thought and instill new avenues of perspective in the listener. The consistent level of intelligent and inspiring music-making resonates in the mind and body. Shows include electronic processing, performance art, visual art, film, and dance, providing deeper context for the music. Unique artist pairings, diverse programming, and the integral incorporation new work all contribute to Ear Heart Music playing a major role in reshaping the chamber music landscape for the 21st century. All quotes from Time Out New York.